Every summer when the produce gets really ripe I crave this super addictive, colorful salsa – a recipe I picked up from my friend Colleen back in the day and tweaked to my liking. There are lots of variations of corn salsa out there (like Anne’s!) but I like to load mine with pretty much every salsa ingredient under the sun to get a mix of crunchy and soft, sweet and savory with a little spice to kick it up. Definitely buy thick tortilla chips to serve with it so that you can pile all the goods onto your chip without it breaking! In a large bowl, combine black beans and corn. Chop tomatoes, red pepper, mango, avocado and green onions and add to bowl, mixing to combine. In a small bowl or measuring cup, whisk together olive oil, lime juice, garlic, cumin, cayenne, salt and sugar. Chop cilantro and whisk into dressing. Pour dressing evenly over vegetables and mix lightly to coat. 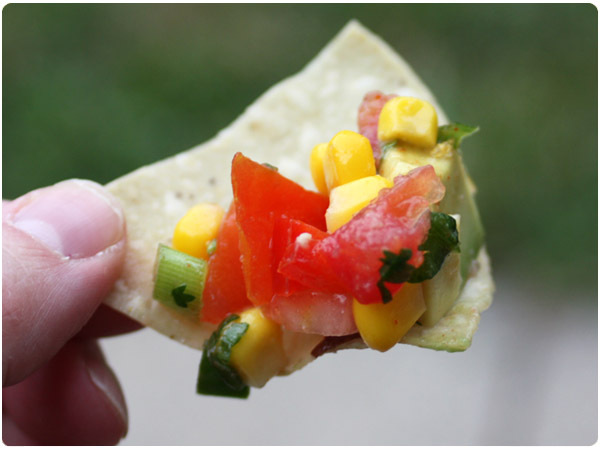 Serve with tortilla chips as a salsa or just as a side salad. 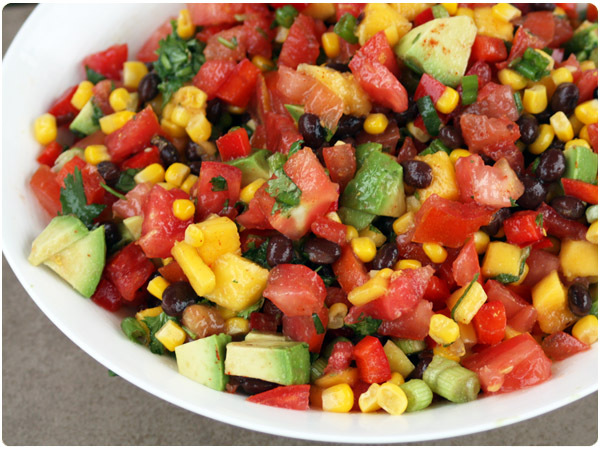 I am loving variations on summer salsa! Corn, black beans, avocado – what more could you want? this looks so good!! — perfect for the hot summer heat!